There’s a chill in the air, December is here, and we’d by lying if we said this wasn’t one of our favorite times of the year! With visitors from near and far looking to get into the holiday spirit with fun and exciting new experiences, I-Drive’s calendar for this December is full of everything you and your loved ones need to indulge in a seriously good time as we approach the Holidays! Hard Rock Live’s calendar is jam packed with live performances that are sure to stun! 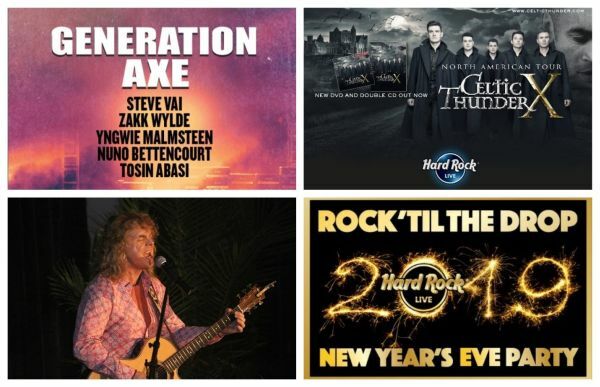 Generation Axe features a super group of some of the greatest guitarists of all-time including Steve Vai, Zakk Wylde, Yngwie Malmsteen, Nuno Bettencourt, and Tosin Abisi all of whom will be performing on December 9th! Make plans now though, because we are sure tickets won’t last! Then, on December 14th Universal’s Hard Rock Hotel will be hosting Carl Dixon, formerly of the Guess Who, this show is sure to get everyone up and dancing while he performs some of his greatest hits like, “American Woman” and “These Eyes.” But, if you’re looking for something a little different from the usual, be sure to head to Hard Rock Live on December 16th to catch a live performance from Public Television phenomenon and multi-platinum Irish group, Celtic Thunder! And finally, finish off the month, and year, with a bang at the Rock Til’ The Drop 2019 New Year’s Eve Party being held at Hard Rock Live on December 31st. The doors open at 8:00pm, and the event welcomes all ages. Your general admission ticket will include a dinner buffet, unlimited soda and water, and a champagne toast at midnight for guests of drinking age! This is going to be a party that you won’t want to miss. 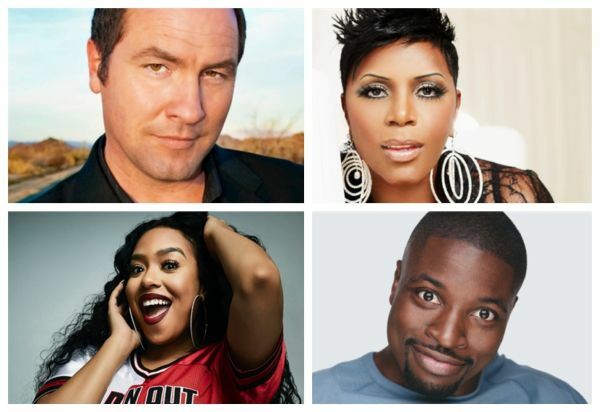 We know the holiday season can be stressful at times; but, if you’re looking for the perfect way to let loose, unwind, and enjoy a good laugh – you’re in luck because the Orlando Improv has quite the line up prepared for the month of December. Kicking off the month with a hilarious performance by Joselito Dapuppet and “The Litos”, on December 6th, providing the perfect mix of young and old, this show is both enjoyable and relate-able for audience members of all ages. Then, prepare for an unforgettable show by the Queen of Comedy, Sommore, who will be performing from December 7th through the 9th. Jess Hilarious will follow, taking the stage on the 10th and 11th; best known for her appearances on MTV’s Wild N’ Out, she is no doubt an accomplished stand-up comedian who has taken the comedy world by storm since her first tour started in 2017! And if Wild N’ Out was one of your favorite guilty pleasures, B Simone will also be taking to Orlando Improv on December 19th – so be sure you don’t miss a performance from this extremely talented young performer! The next comedian Orlando will be welcoming this month has done it all in his 30 years as a comedian; from stand-up specials and sitcoms to travel shows, talk shows, and podcasts, Tom Rhodes has built himself quite a reputation for putting on a memorable show for all of his audiences, so be sure you’ve locked in your tickets to see him perform live December 20th through 22nd! Finally, Preacher Lawson, is taking to Orlando to help us ring in the new year with a good laugh (or two)! Join him as he takes the Orlando Improv stage December 30th through the 31st. Not only will he be putting on live performances, but there will also be a special event held on the last day of 2018 that is sure to be a great time! Get into the Holiday spirit when you attend one, or all, of the many events being held by Rosen Shingle Creek this month! Their Winter Wonderland will be held on December 8th, 15th and 22nd, so hop aboard the, “Shingle Creek Express”, grab a delicious bite to eat at one of the hotel’s award-winning restaurants, and indulge in various holiday themed activities as you take in the spectacular lighting and holiday décor around the resort! On these event nights, Rosen Shingle Creek will also be hosting dance and ballet performances for the whole family to enjoy, a holiday chocolate display that will be open for viewing for the entirety of the month, plus a non-profit partner Christmas Tree Display as well! This display features Christmas trees decorated by each of International Drive Non-Profit Partner Organizations to raise money for children and those in need in our community! Get all the details you’ll need for each of these spectacular holiday events here. But what gets someone into the Christmas spirit more than a mesmerizing performance of the Nutcracker? Central Florida Ballet will be holding their 18th annual performance of the Nutcracker. What is recognized as ‘one of the top five productions in the nation’ by CNN; there is no doubt that if you’re on International Drive on December 15th and 16th, you need to be at the Orange County Convention Center to catch the show! With only three showing, be sure you purchase tickets soon, or you may miss this breathtaking show! Despite that we are in Florida, we all like to enjoy the beauties of the cold weather! And back for it’s third year, Rosen Plaza Hotel’s Iced Out Competition brings visitors just that during this free, public event! Orlando’s top chefs rev up their chainsaws to put their skills to the test in a battle for top honor in this intense outdoor ice carving competition. Partnered with Canine Companions for Independence, this event will feature delicious holiday treats, specialty cocktails, and 10% of each purchase will be donated to the Canine Companions for Independence. Whether you are escaping the cold weather by visiting International Drive for Christmas and the New Year – or you are a local who knows just how magical the holidays are here; be sure to check out the various Christmas dinner specials that will be going on, as well as locations that will be putting on unforgettable parties to ring in the new year! December is no doubt a busy month of everyone; but, during your holiday preparations, be sure to make time for some fun! Check out all the events going down on I-Drive this month and enjoy a good time this month!